I discovered a beautiful blog called Bloomacious this week during my searches for all things Grey Gardens. 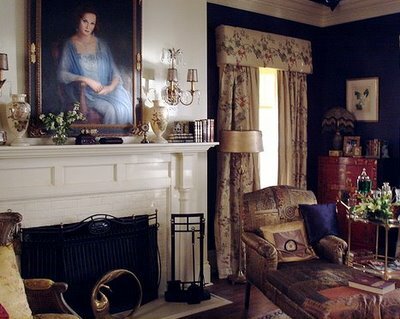 They have a wonderful interview with Grey Gardens Production Designer Kalina Ivanov and many more photos of the sets from the film that you can see there. If you have missed Valorie’s series of posts about Grey Gardens on her blog Visual Vamp, I highly recommend them. She actually knew the Beales and has fascinating personal stories to tell about them. Watching this beautiful home age and decay during the course of the film was painful. I’m sure you’ve seen the images of it with trees growing through the walls and English ivy covering the windows. Happily, Grey Gardens was purchased and completely restored by Sally Quinn and Ben Bradlee. Architectural Digest published photographs of it that you can see here. Over at Content in a Cottage you can watch a video that shows the lush grounds and some of the home’s interiors today. Diane Keaton's Yellow House in the Movie "Baby Boom"
The gardens are amazing. So much time, money, and effort to make it look effortless. It’s less fun for me with I think about the Edie’s. I happier without the drama. Julia. Love love love that house. The bedroom in particular. It speaks of a time gone by. Thanks for letting me leave my linky. I’ve never heard of that movie, but that’s a pretty house! It makes me sad to see old homes (and barns too) abandoned and falling apart. I’m so happy to hear that Grey Gardens was saved and restored. 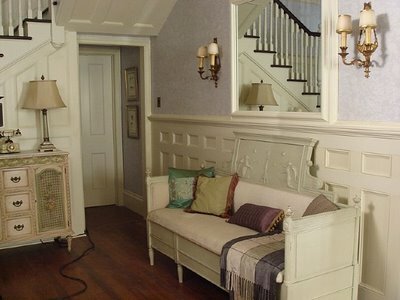 I love the wainscoting in the hallway/staircase area. It looks like the original wainscoting is still there, but now it ends where a doorway used to be. The fireplace looks original too. Oh, that house is just beautiful. I have not yet seen this movie, we have no HBO! Thanks for sharing this, I will go read more about it. Misti England’s last blog post..Our Childhood Bedrooms: My first Linky Party! Julie @ Organizement’s last blog post..Always Something, Isn’t It? I did not see this movie…, I wanted to, was looking forward to…, how could I have missed it…, what an intriguing story it is. I hope I’ll find it on HBO on demand. Amazing home, amazing story! Cannot wait to see the HBO movie! The entry way is my favorite. Okay, I probably have been under a rock lately, as I have never heard of the place. Its completely heavenly. Now I’m curious, because it looks rith up my alley…. Off I go to Google – house and movie! I hadn’t seen this movie. Thanks for the heads up on it. I’m especially interested since you describe the house as a character, too. Katie @ makingthishome.com’s last blog post..Our Summer Plans – Revealed! I haven’t seen the movie. The house is beautiful! Gayle’s last blog post..Pet Parade Coming Wednesday! Thank you for featuring my design. I’d like everyone to know how fun this project was and how supportive HBO has been in making the film. Although we had the architectural plans of the original Gray Gardens, the director, Michael Suscey, and I had much room for interpretation. We used only vintage wall paper and many antiques. I recently watched this movie and loved it! The acting by Drew B. and Jessica L. is supberb. The story still lingers w/me and your post today has given me more places to search for more information regarding this story. Thanks! Susan’s last blog post..Welcome to Hooked on Fridays and the 35th Tablescape Thursday! “Grey Gardens” is also an excellent documentary about the pair from 1975 and Netflix has it. I have the movie on my DVR to watch but I have seen the documentary that the movie is based on and it so sad how the two women lived. It’s amazing to see the pictures here of what the house looked liked originally. I know they said in the documentary that they didn’t have much money after the husband left the mother but it’s hard to believe that they couldn’t keep the house up in some way. I don’t know, maybe there’s more of an explanation in the movie. I’ve seen the documentary and saw the Broadway show. I was hoping that they would film that because Christine Ebersole was so fabulous. Since the movie was on HBO and I no longer have it, I’ll have have to catch it when I can. I will also have to check out the links that you posted. I LOVED reading Valories up close and personal posts. Saw the movie. Interesting…very. Mmm…it looks so sumptuous and rich. I can’t wait to see the movie so I can check out the house! Thanks for hosting this awesome party! I so wanted to see the movie, but I do not have HBO. Your pics are awesome and so is your blog. Nola @ The Bloom Girls’s last blog post..A Healthy Start for Spring! Classic home. Love the Hamptons. Beautiful area. I love, love love Greay Gardens! I actually did a post on it a couple months back! I was so thrilled when I heard they were making a movie that would fill in the some of the blanks… it was wonderful!!! Love this post and thanks for all the added links!!!! yay!!! I must see that movie… sadly no HBO… hurry up DVD!!! I taped it and haven’t watched it yet, so I’m trying not to read too much! 🙂 Happy weekend! The World According to Isa’s last blog post..Treasure Hunting…. 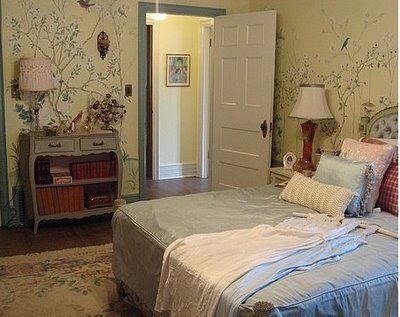 I posted a link to another great GG article called Inside Grey Gardens that I think you will just love. Robin Rane’ ~ All Things Heart and Home’s last blog post..Stephie’s Monster Cookies! Valorie did an amazing job positing about this movie and the history behind it. The set designs were just gorgeous and the story about the two Edies was fascinating. I just stumbled upon your blog today……..so glad I did! I linked up, since your blog is SO much more suited to me than Frugal Friday (which is also a great carnival). Thanks for hosting this! So many new amazing blogs for me to explore, but first I gotta see some more of yours. I don’t think I saw the movie, but gosh that house is BEAUTIFUL!! Thanks for the lovely treat this morning!! Have a wonderful weekend Julia! TidyMom’s last blog post..Just because he’s SO cute!! I have a bit of a Grey Gardens obsession, too. After all it’s in the same county as Beach House and if we don’t look after our home it could turn out like the Beale’s house did in the 70s….. It’s wonderful that the present owners kept their word and restored Grey Gardens, not many people would have undertaken a renovation of that magnitude. For the most part I don’t mind not having cable. Then a movie like this comes along and I am frantically trying to get it in my Netflix inbox because I have heard so many things about it. Never heard of the movie. I wish that I own that house. I loved the movie and Drew was FAB! Thank you for all the pictures and links to more info about the family. I think they’re quite fascinating. Petunia’s last blog post..Fashionable Candy Friday! Julia, This MOVIE was so YUMMY! I sat down and couldn’t even think about getting off my couch for 1 nano second. The HOUSE…to die for! I really want to see the documentary now. Thanks for the links above…I’ll have to find a few moments to peek. I didn’t see the movie but I LOVE that house.It is in my dreams! desiree’s last blog post..Petaluma Antique Faire is HERE! Hey there! I’ve been coming by for a while but have never left a comment nor have I joined in on the Friday fun but this time I am! I absolutely love your posts because I’m totally hooked on houses! My father is a luxury home builder so I’ve always been facinated by homes and all that it takes to build one to perfection. Anyway, just thought I’d say hello and keep doing what you’re doing … I love it! I wanted to see the movie just for the interiors. I’ve always felt torn about this story; I am as fascinated as anyone else, but I think that the Edies were exploited. Despite their agreement to being filmed for the Mayles’ documentary, they clearly were not in any condition to make informed decisions. I wish someone from their family had shielded them. However, having experienced my mother’s dementia, and the near-impossibility of influencing her or making things “better,” I have more sympathy now for the Bouvier family; there probably isn’t much they could have done. But while I no longer blame the family for the situation, I do blame the brothers who photographed and documented this private tragedy. Thank you for hosting your blog party. It is so fun every week to see what everyone is hooked on. Angela @ Imaginecozy’s last blog post..Redesign with what you have already. I’ve never heard of that either, but that house is beautiful!! I love the picture of what seems like it’d be the foyer. LOVELY!! Thanks for sharing, Julia! I had not heard of Grey Gardens until I read about it on a friend of mine’s website. We don’t have HBO but I wish we did because I would certainly watch this movie. The house is beautiful..I did see pics of it in it’s deteriorating condition on my friends blog. Such a shame…but I’m glad it has been restored. How funny. We just put the original Grey Gardens documentary from the 1970s on our Netflix. I recently read that the daughter living in the house in the 1970s was looking to sell it after her mom died. She wouldn’t sell it to anyone who was planning to rip it down. Ben Bradlee walked in to its squalor and said to her, “This is the most beautiful house I’ve ever seen!” and she said, “I know! It just needs a fresh coat of paint and it will be perfect!” I can’t wait to see the films — both the HBO and the documentary. Slowish Food’s last blog post..Whoo-hoo! Guess Who’s One Year Old? So glad you did this post…I saw Sally Quinn and her son on THE VIEW this week, and they talked about the house and renovating it. I couldn’t figure out if she still owned it or not, and did she live there full time???. The son said he lived in what he called a group home next store to her…so I was a little confused. Anyways thanks for sharing this beautiful renovation. I didn’t get to see the movie, but thanks for sharing the pics! I love all of the white woodwork in the foyer. 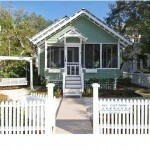 Daly Essentials’s last blog post..Former spaces..
We watched Grey Gardens last night. The accent of the New England Upper Crust was hysterical to us Southerners — probably as ours is to them — but the story was so poignant. It was almost unbearable to watch the house fall into ruin — and its occupants being so oblivious to its state of decay. Scribbler’s last blog post..Tablescape Thursday April 23 — New Dishes! You’ve peaked my curiosity, so now I want to watch this show! I saw part of this movie last weekend…and can’t wait to see the whole thing…I loved it. What a lovely house! Thanks for sharing it with us. I have been in volunteering overload lately but will be back to blogland very soon. Oh, I want to see this movie. What an amazing story – thanks for sharing it with your readers. Hi Julia!! What a fun blog party! Thanks for being the fabulous hostess. ps. I linked twice because I messed up the link the first time. Really sorry. Deana with ALCHEMY’s last blog post..Hooked on fabric! For some reason I never saw the documentary but I DVR’d the HBO movie last weekend and hope to get to it soon. Thanks for posting this. Now I’m extra looking forward to seeing the film and comparing against the links you’ve posted. I had no idea a new movie had been made about Grey Gardens! I saw the documentary from the 70’s and you could not help but be captivated by the family and the house. Hopefully, this will be released on DVD since we don’t subscribe to HBO. Robyns Online World’s last blog post..Walmart Remodel – UGH! I saw Grey Gardens and it was very interesting to learn about the Beale ladies. The home was absolutely beautiful! It was a shame to see it (and the ladies) deteriorate like they did. Peacock Blue’s last blog post..What’s Hot…. I saw Grey Gardens on Broadway in New York. I would like to see the movie. I got all interested and looked up many things about these ladies and there are some video on Youtube you can view. I haven’t seen the movie but like the actresses and would probably like the movie. I saw the movie, it is so easy to get hooked to it, it was very interesting!!! Great post! I’ve been a little obsessed with Grey Gardens & the 2 Edies ever since I first saw the documentary years ago, and the HBO film was such a nice surprise. They clearly put a lot of effort into doing everything right, including their faithful recreation of the real Grey Gardens up in Canada. And I was so pleased to see Kalina Ivanov receive a very well-deserved Emmy for the amazing work she did. To me, Little Edie’s accent is kind of hard to peg. She did speak like her cousin Jackie, but her accent was noticeably different from Big Edie’s…and Big Edie was part of a wealthy family which divided its time between a posh NYC home and their beautiful Long Island estate. Somebody somewhere suggested that Little Edie’s speech was influenced a lot by her time at Miss Porter’s School and also by hearing her very southern father’s accent. I loved hearing Little Edie talk, but I tend to think she had her own totally unique way of speaking. I grew up in the the so-called “Great Estates” region of the Hudson Valley, and the old-money types there always reminded me of the way FDR used to speak, or the way George Plimpton speaks…he’s still alive, right? Anyway, fascinating characters, splendid house and 2 great movies! Everyone should try to catch the HBO version if possible. As usual Jessica Lange was wonderful, but Drew Barrymore was surprisingly good too. Exactly what I was looking for! I can’t believe there are so many others like me who loved that house in Alvin and the Chipmunks! I’ve been looking for pictures of it on line for the longest time, until somehow I stumbled onto your site. And then what a treat to find so many of the other houses that I loved on movies!